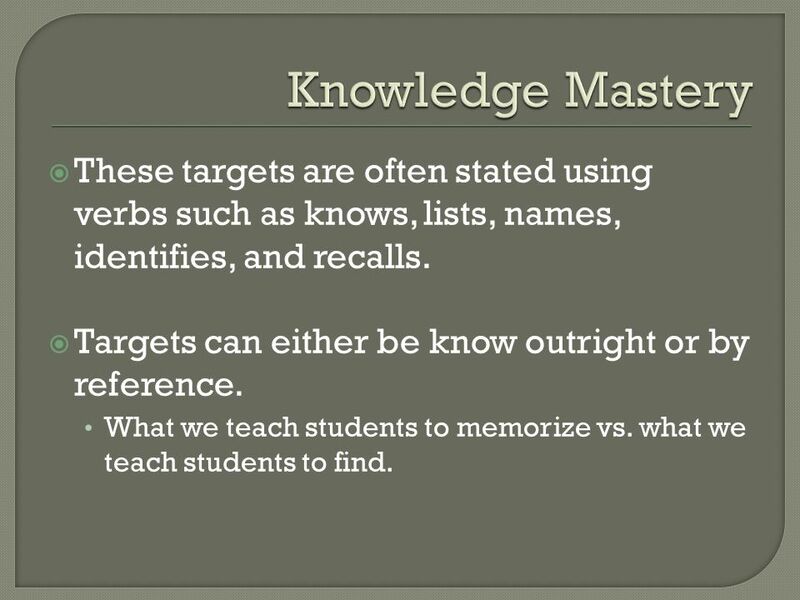 7 Knowledge Mastery These targets are often stated using verbs such as knows, lists, names, identifies, and recalls. 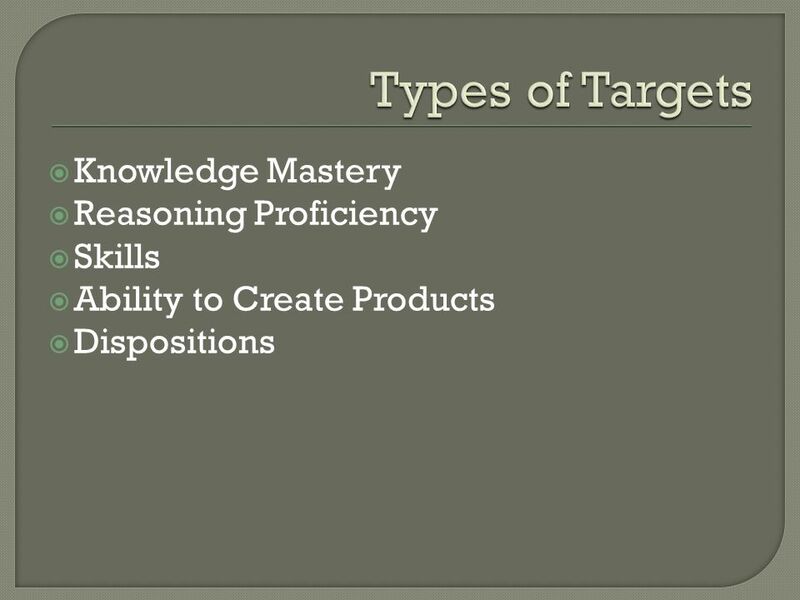 Targets can either be know outright or by reference. 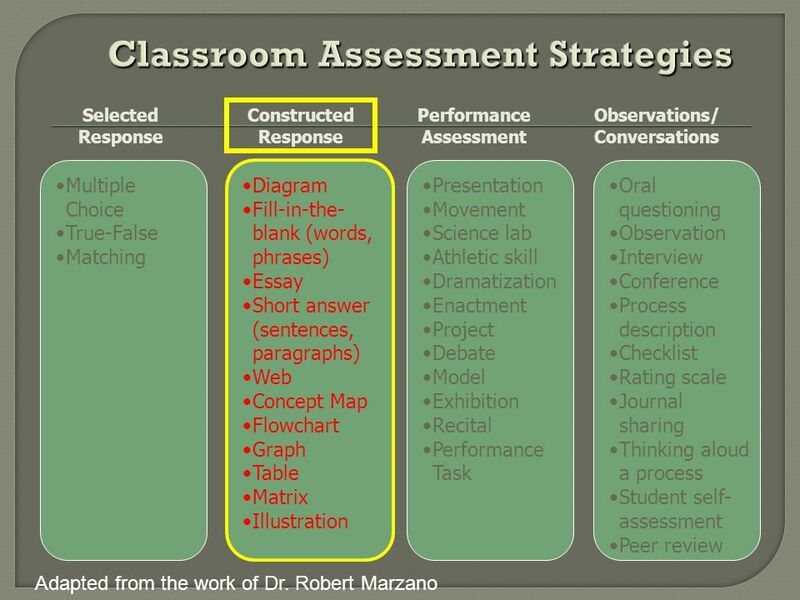 What we teach students to memorize vs. what we teach students to find. 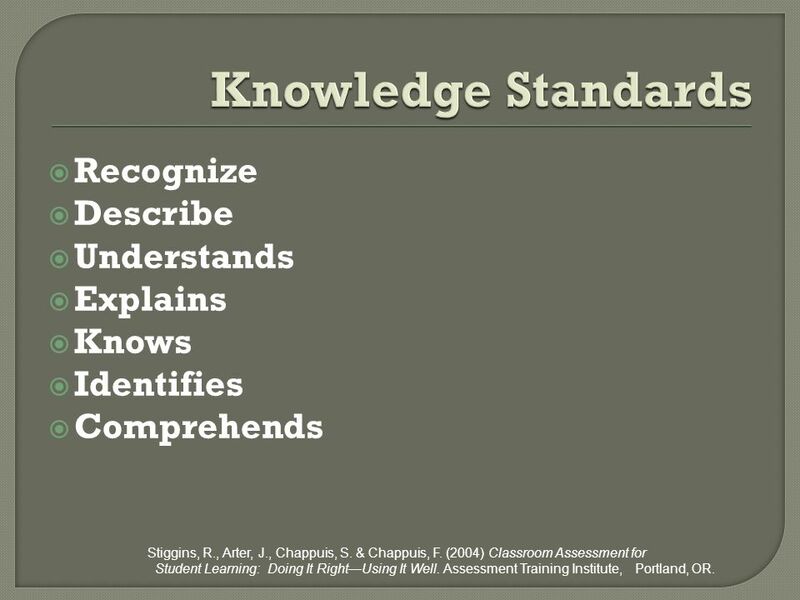 Identifies Comprehends Stiggins, R., Arter, J., Chappuis, S. & Chappuis, F. (2004) Classroom Assessment for Student Learning: Doing It Right—Using It Well. Assessment Training Institute, Portland, OR. 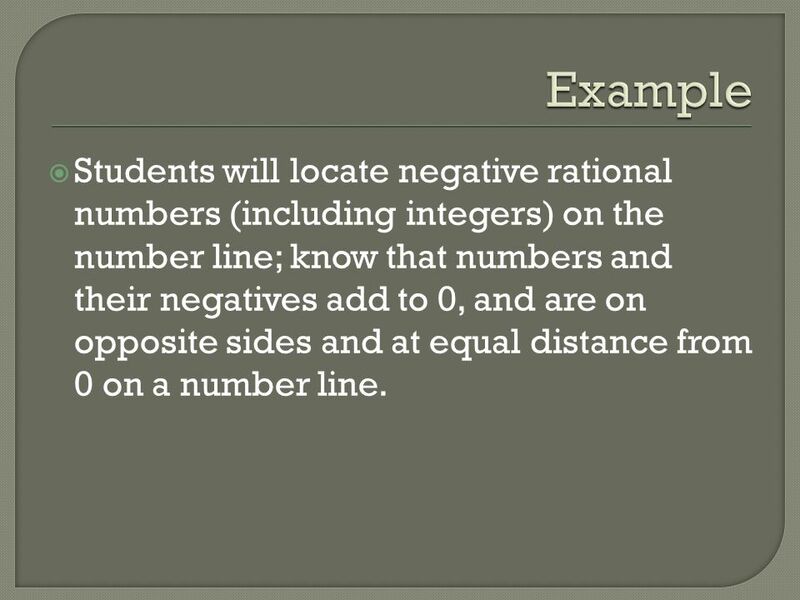 9 Example Students will locate negative rational numbers (including integers) on the number line; know that numbers and their negatives add to 0, and are on opposite sides and at equal distance from 0 on a number line. 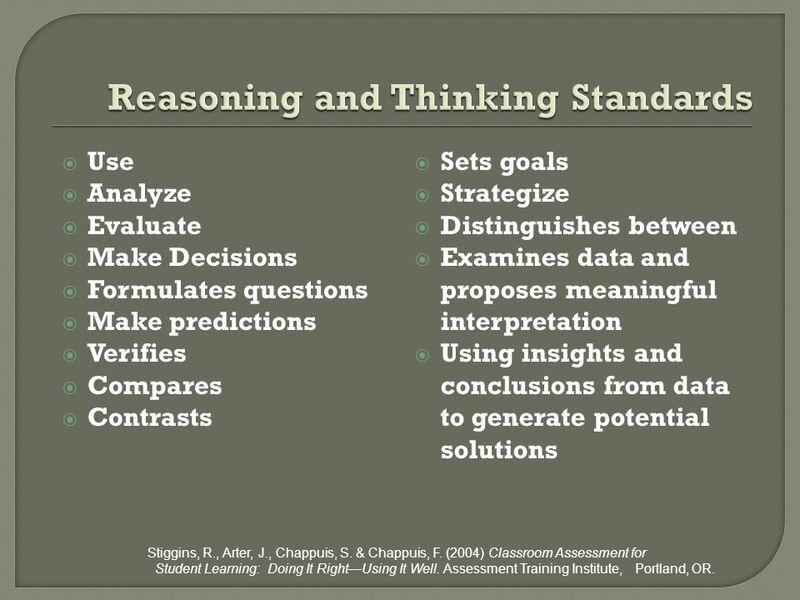 Use Analyze Evaluate Make Decisions Formulates questions Make predictions Verifies Compares Contrasts Sets goals Strategize Distinguishes between Examines data and proposes meaningful interpretation Using insights and conclusions from data to generate potential solutions Stiggins, R., Arter, J., Chappuis, S. & Chappuis, F. (2004) Classroom Assessment for Student Learning: Doing It Right—Using It Well. Assessment Training Institute, Portland, OR. 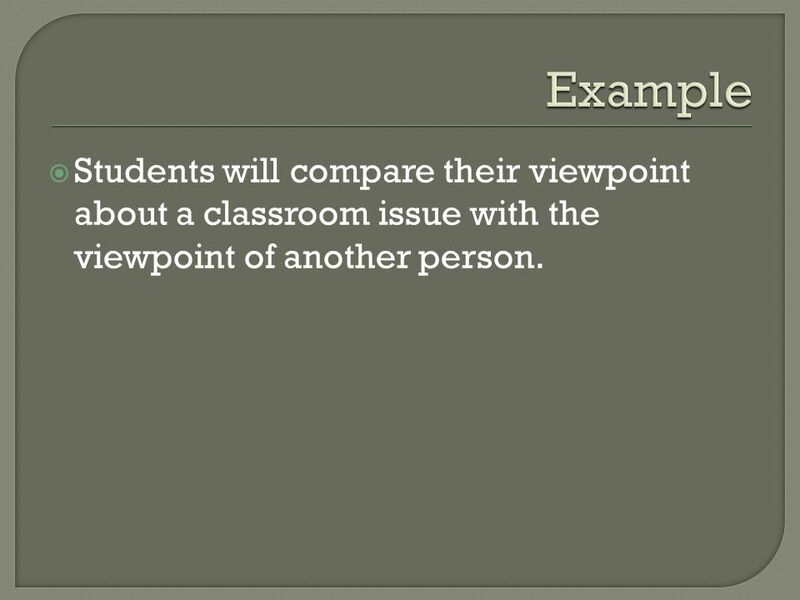 13 Example Students will compare their viewpoint about a classroom issue with the viewpoint of another person. 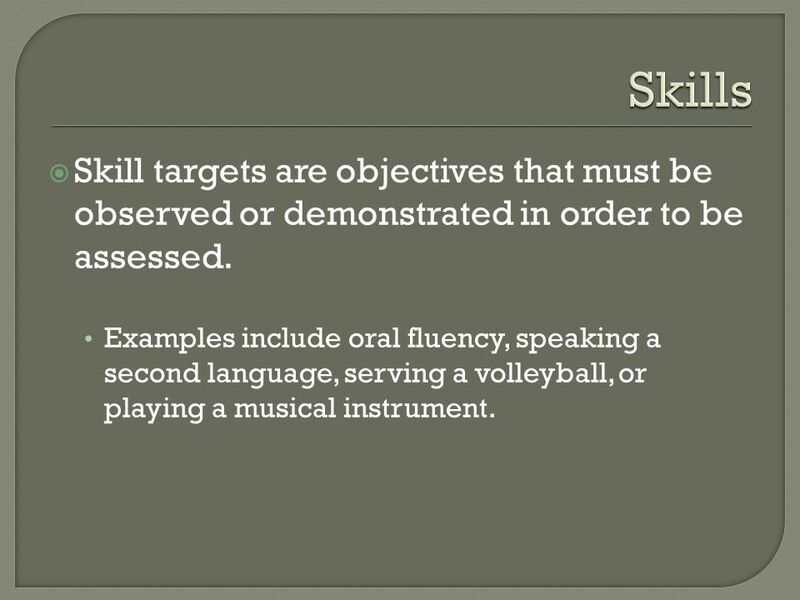 14 Skills Skill targets are objectives that must be observed or demonstrated in order to be assessed. Examples include oral fluency, speaking a second language, serving a volleyball, or playing a musical instrument. 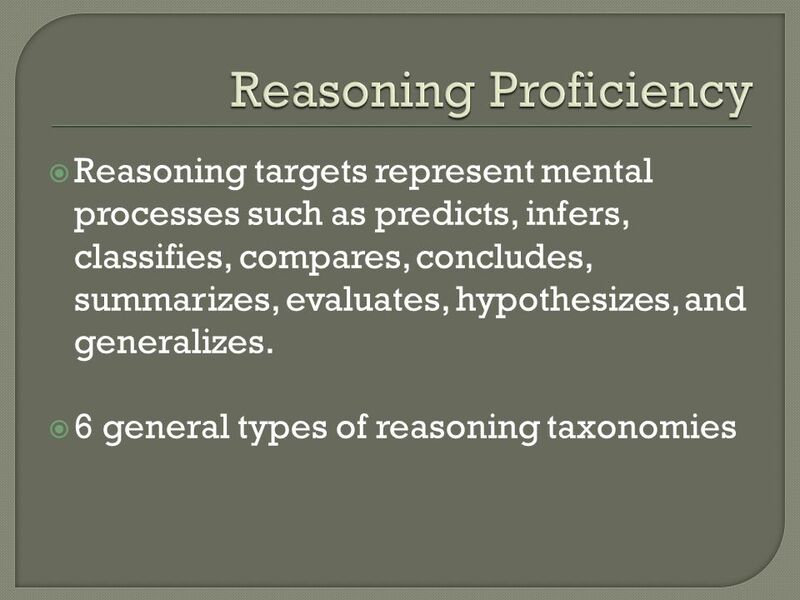 Knowledge targets always underlie skill targets; many reasoning targets also underlie skill targets. 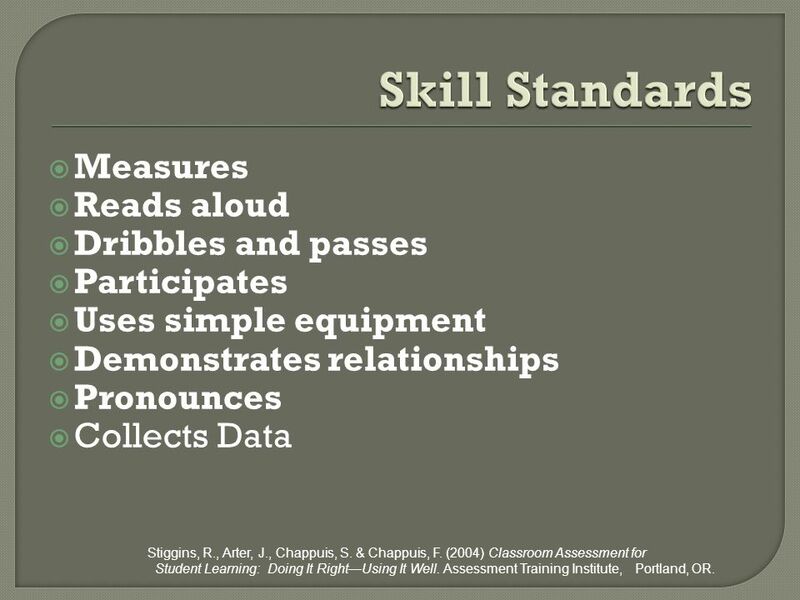 Uses simple equipment Demonstrates relationships Pronounces Collects Data Stiggins, R., Arter, J., Chappuis, S. & Chappuis, F. (2004) Classroom Assessment for Student Learning: Doing It Right—Using It Well. Assessment Training Institute, Portland, OR. 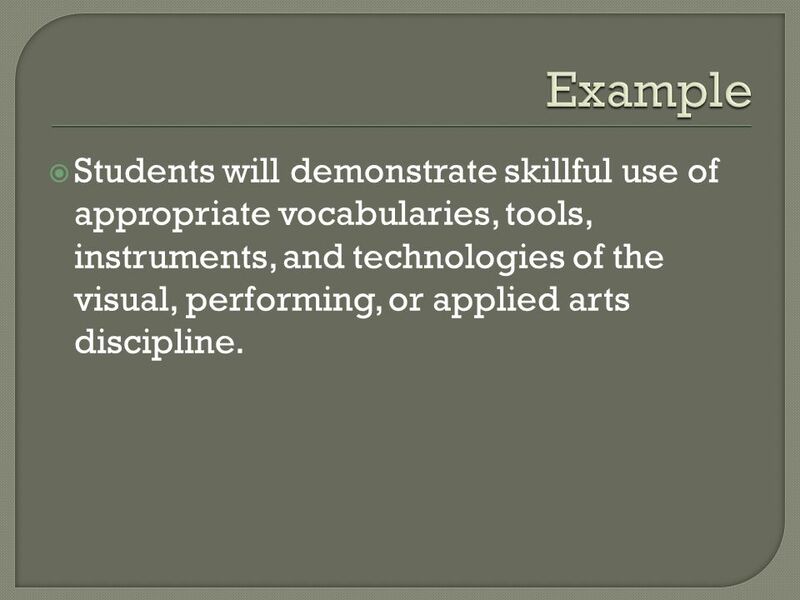 16 Example Students will demonstrate skillful use of appropriate vocabularies, tools, instruments, and technologies of the visual, performing, or applied arts discipline. 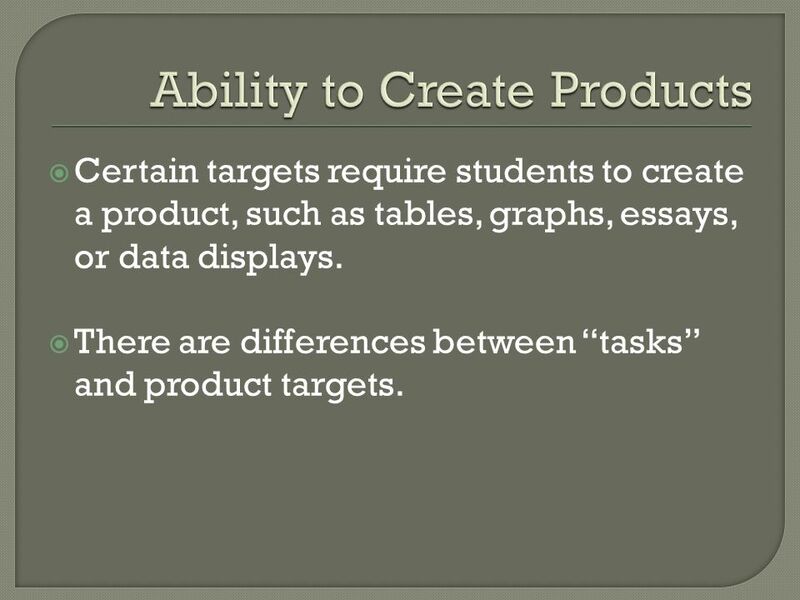 Certain targets require students to create a product, such as tables, graphs, essays, or data displays. 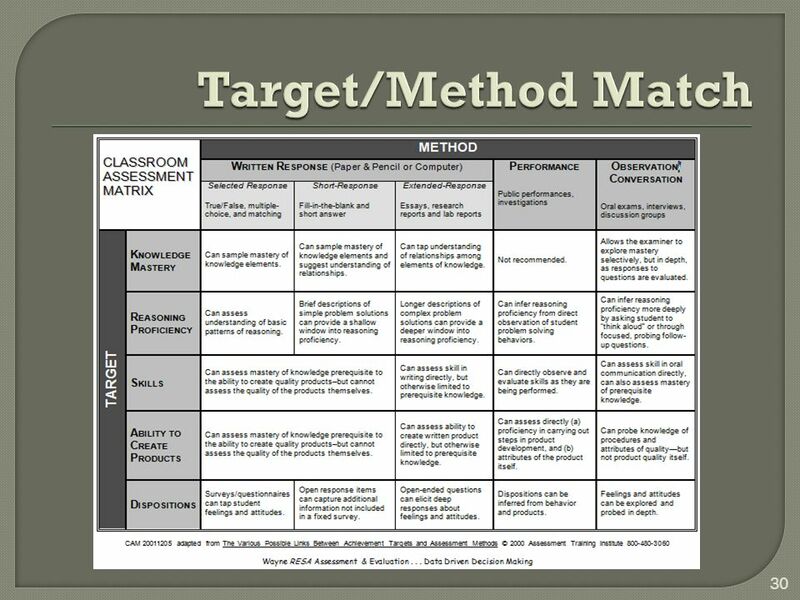 There are differences between “tasks” and product targets. 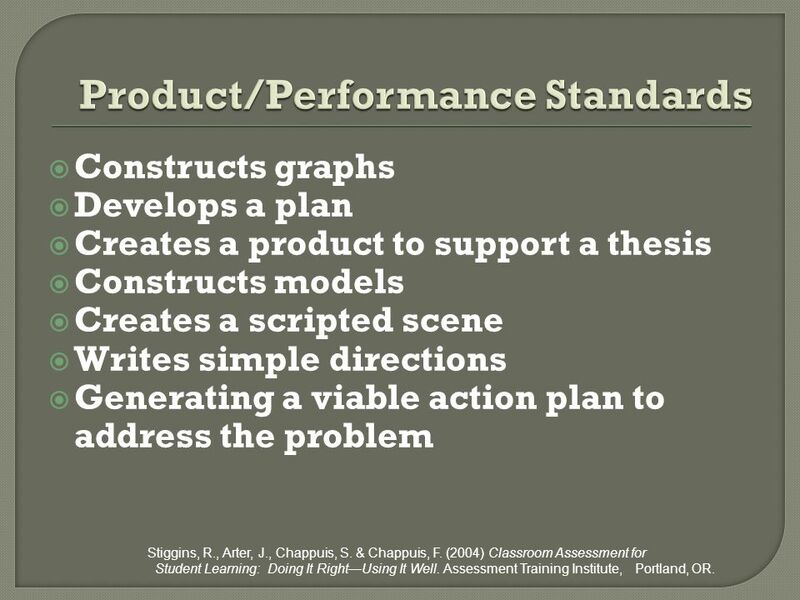 Constructs graphs Develops a plan Creates a product to support a thesis Constructs models Creates a scripted scene Writes simple directions Generating a viable action plan to address the problem Stiggins, R., Arter, J., Chappuis, S. & Chappuis, F. (2004) Classroom Assessment for Student Learning: Doing It Right—Using It Well. Assessment Training Institute, Portland, OR. 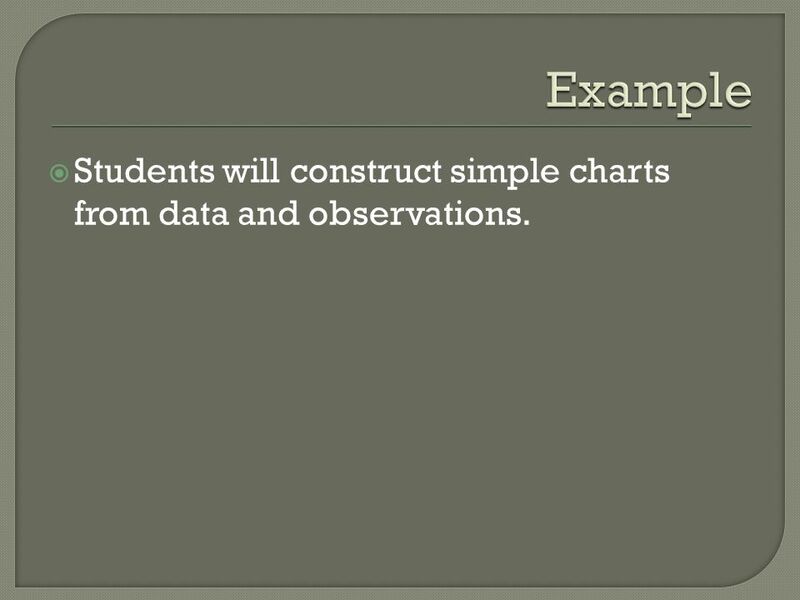 19 Example Students will construct simple charts from data and observations. 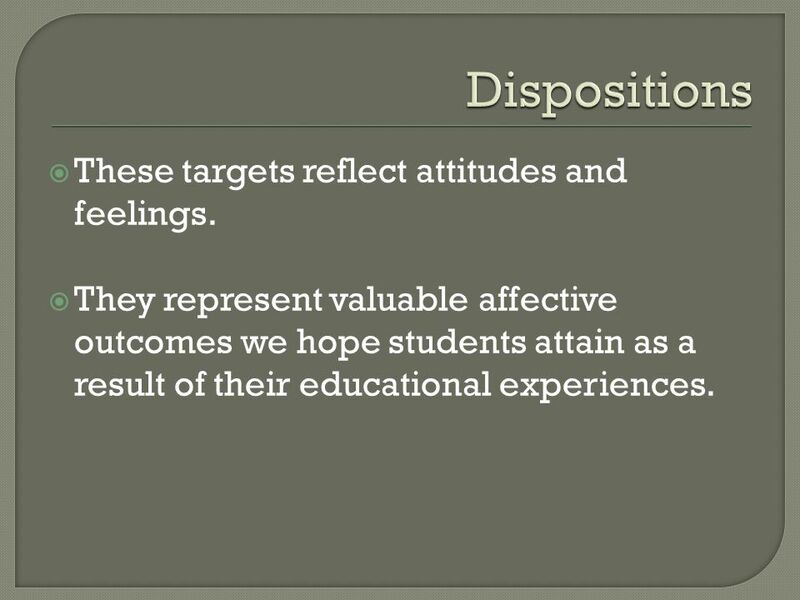 20 Dispositions These targets reflect attitudes and feelings. They represent valuable affective outcomes we hope students attain as a result of their educational experiences. 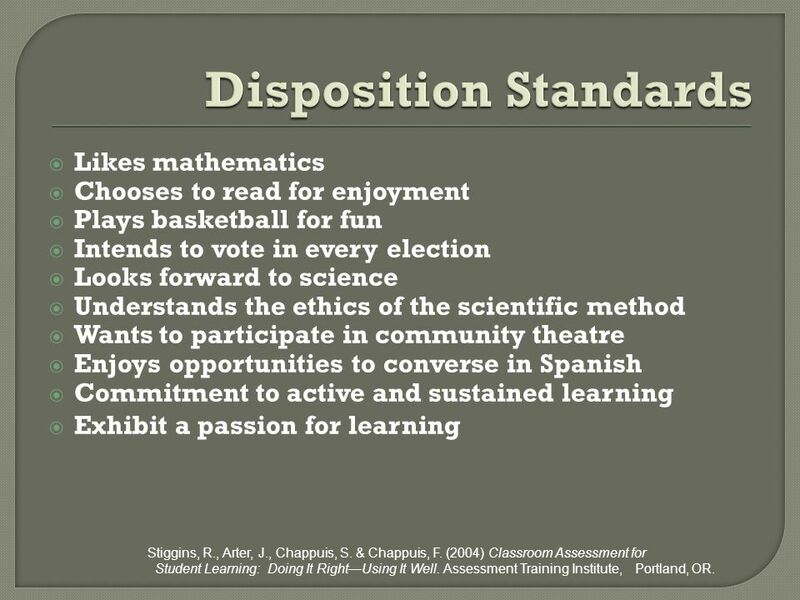 Likes mathematics Chooses to read for enjoyment Plays basketball for fun Intends to vote in every election Looks forward to science Understands the ethics of the scientific method Wants to participate in community theatre Enjoys opportunities to converse in Spanish Commitment to active and sustained learning Exhibit a passion for learning Stiggins, R., Arter, J., Chappuis, S. & Chappuis, F. (2004) Classroom Assessment for Student Learning: Doing It Right—Using It Well. Assessment Training Institute, Portland, OR. 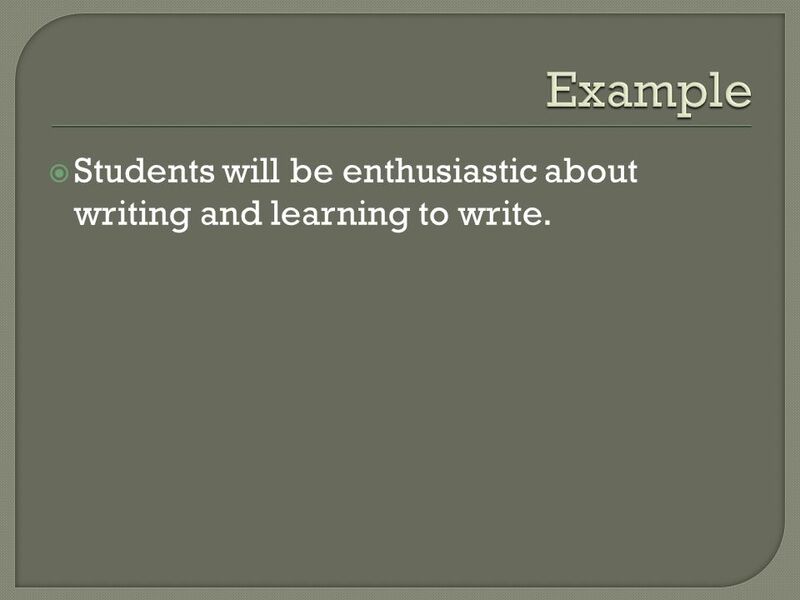 23 Example Students will be enthusiastic about writing and learning to write. 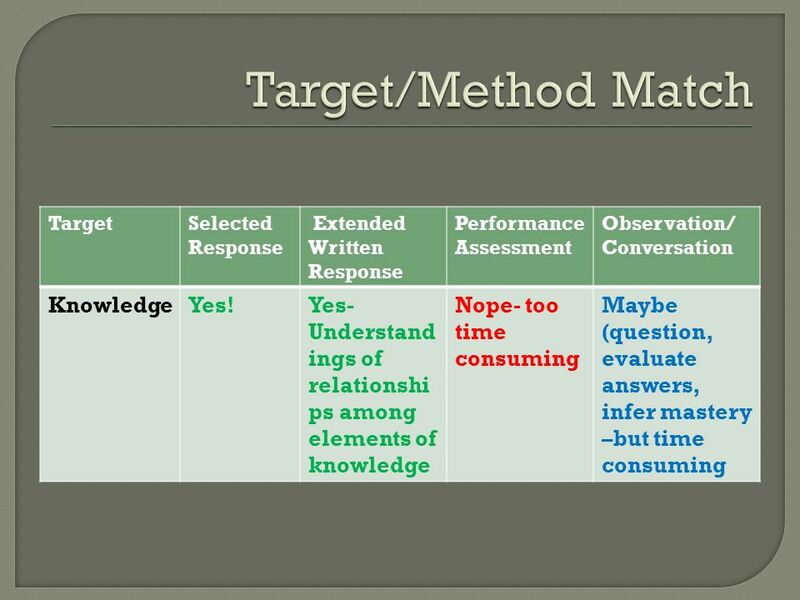 31 Target/Method Match Knowledge Yes! 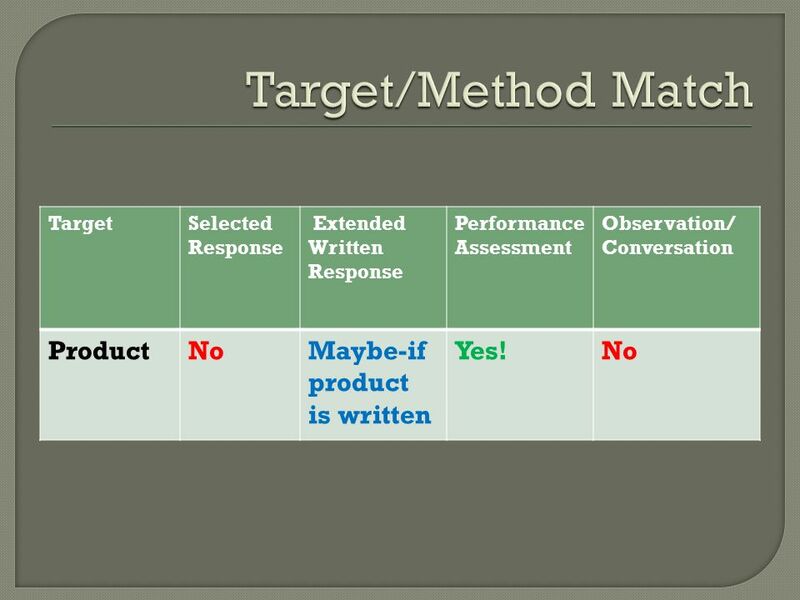 Selected Response Extended Written Response Performance Assessment Observation/ Conversation Product No Maybe-if product is written Yes! 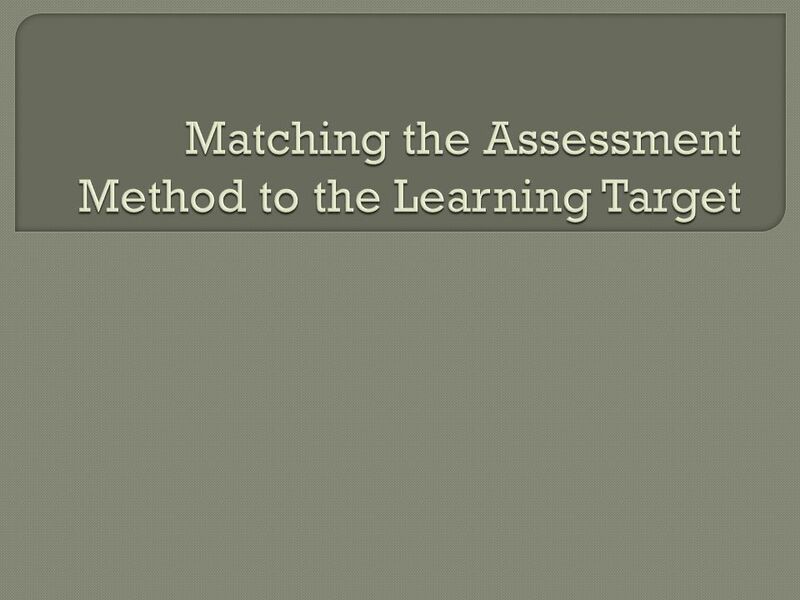 Download ppt "Matching the Assessment Method to the Learning Target"
Evaluation Overview - Basics. 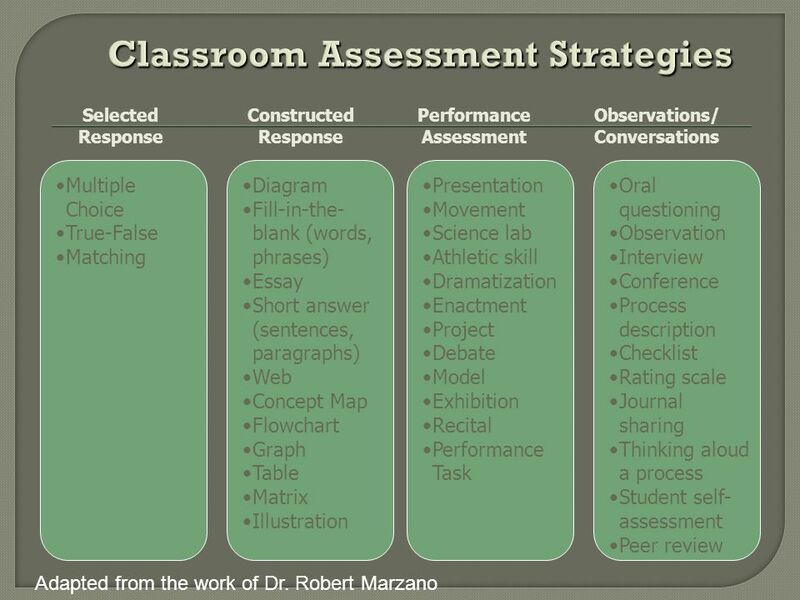 Purpose of Testing Diagnostic Formative Summative. Outcomes and Standards. Outcome Curricular statements describing how students will integrate knowledge, skills, and values into a complex role performance. 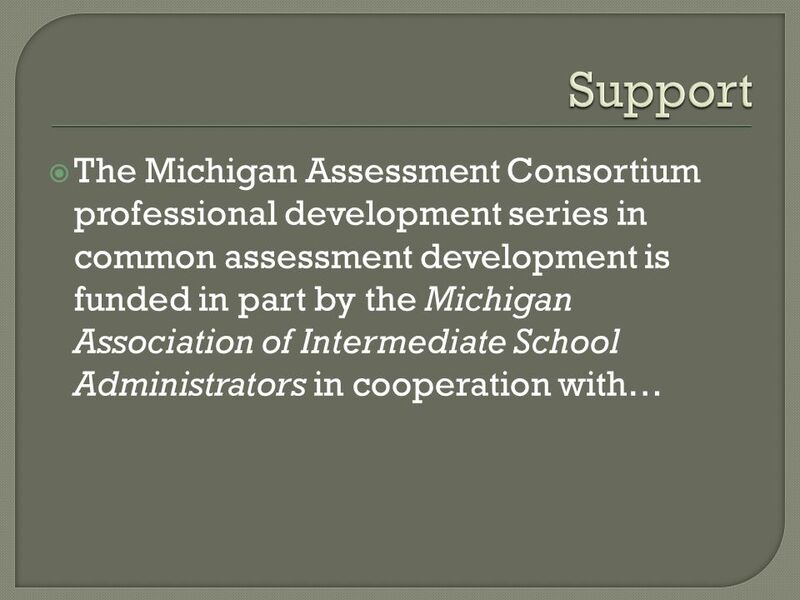 Michigan Assessment Consortium Common Assessment Development Series Putting Together The Test Blueprint. 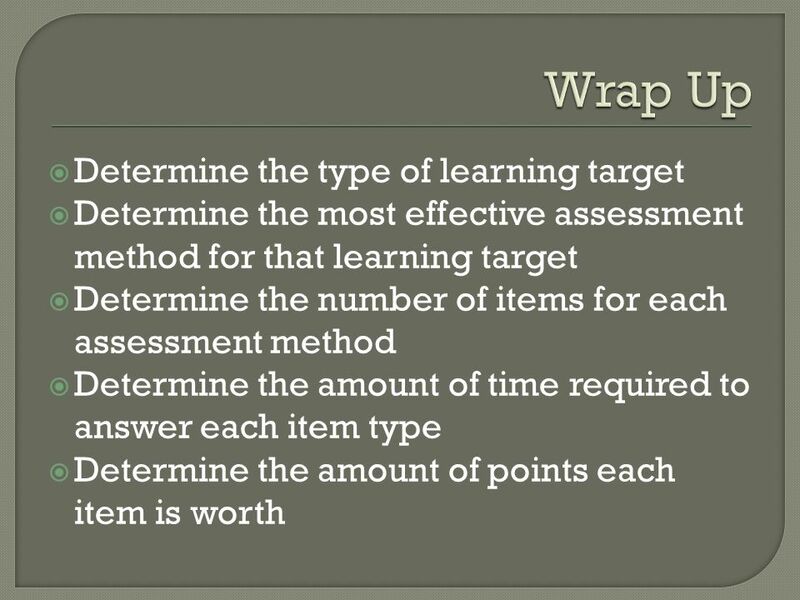 Lecturette 1: Student Learning Outcomes. 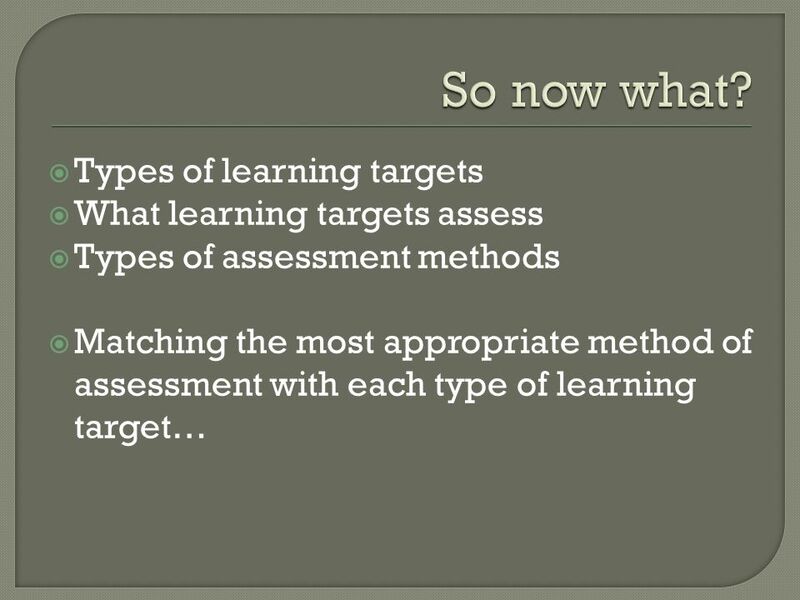 Learning Outcomes In developing good assessments, where do we begin? 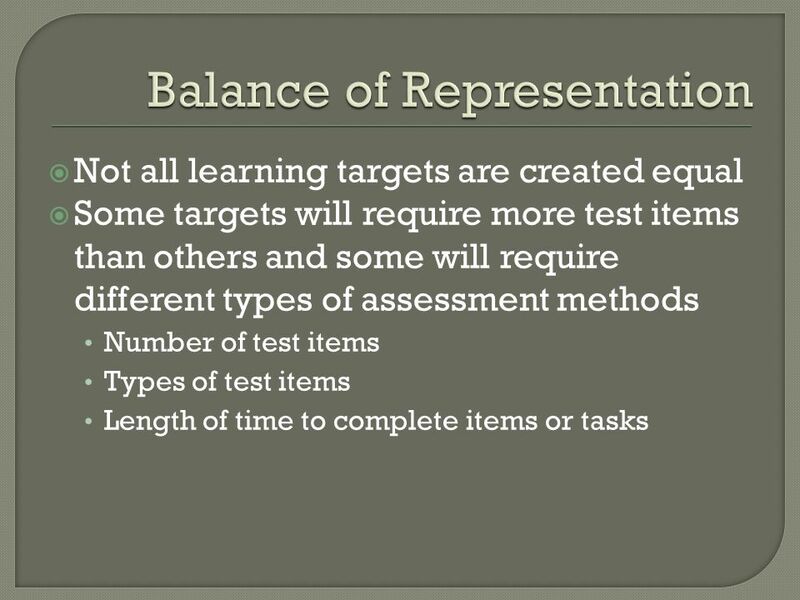 Part VI Proficiency Investigate Different Types of Proficiency- Based Assessment Summer Institute (SI) 2012. Alignment of Virginia Kindergarten through Grade 5 SOL, Essential Skills (Cognitive Domain) and Instructional/Assessment Strategies Purpose: The intended. Student Learning Outcome Assessment Methods Training Conducted at Campus-Based SLO Summit Spring 2014 Student Learning Outcome Assessment Methods. 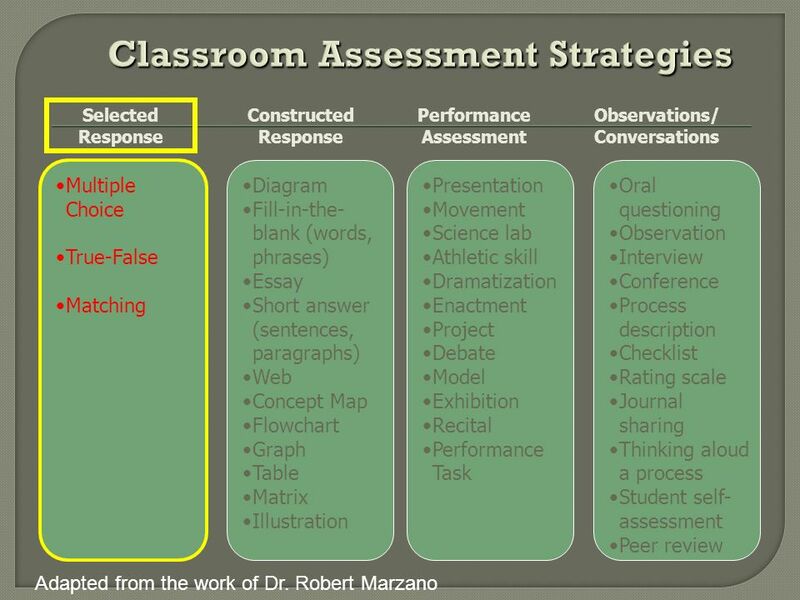 1 The Professional Teaching and Learning Cycle in Action. Core Competencies Student Focus Group, Nov. 20, 2008. 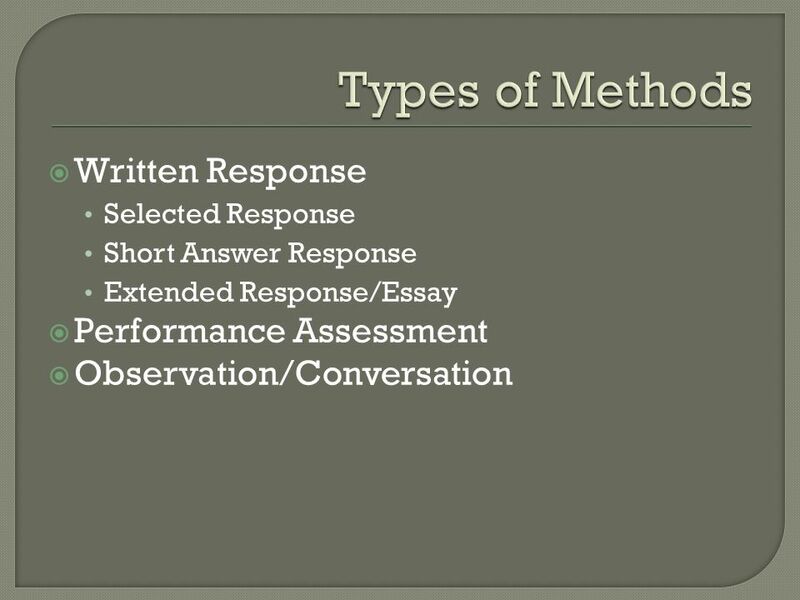 Objectives WRITING WORTHWHILE OBJECTIVES FOR YOUR CLASS. Science Break Out Session New Math and Science Teacher Dec 2008 Becky Smith. 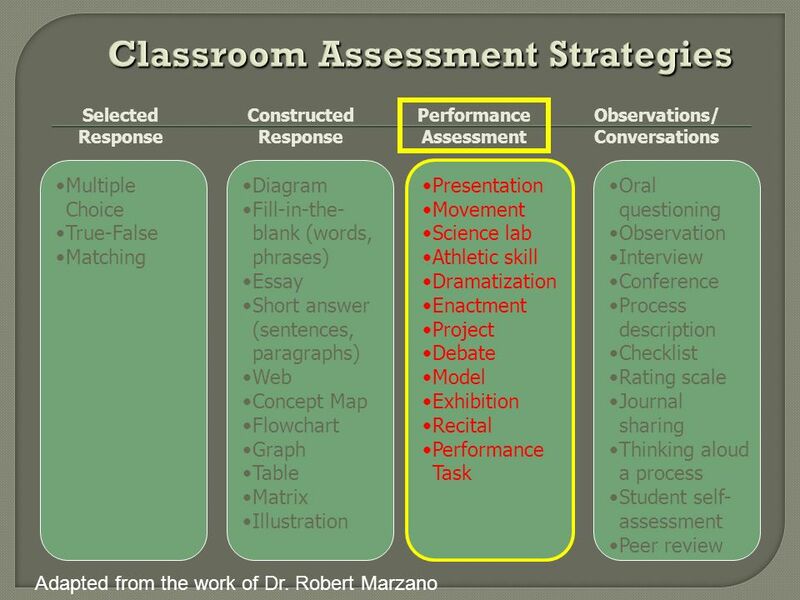 (IN)FORMATIVE ASSESSMENT August Are You… ASSESSMENT SAVVY? 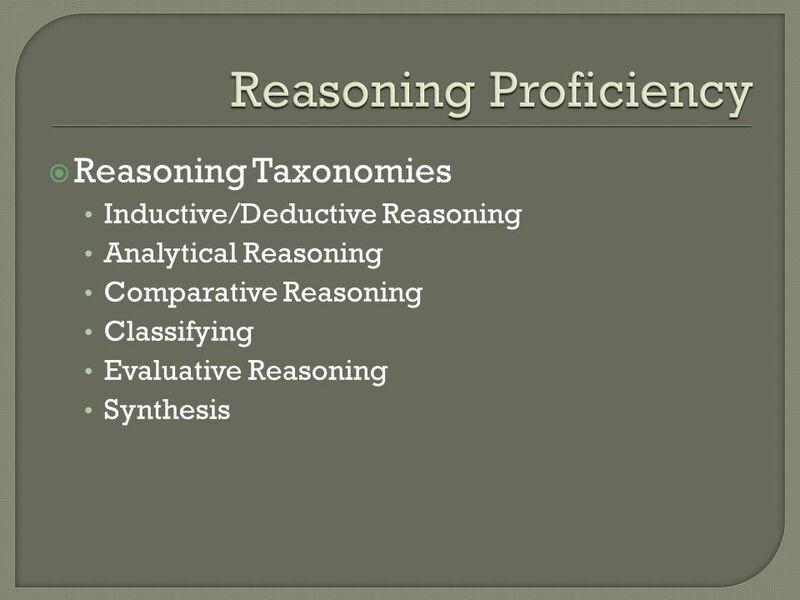 Skilled in gathering accurate information about students learning? Using it effectively. 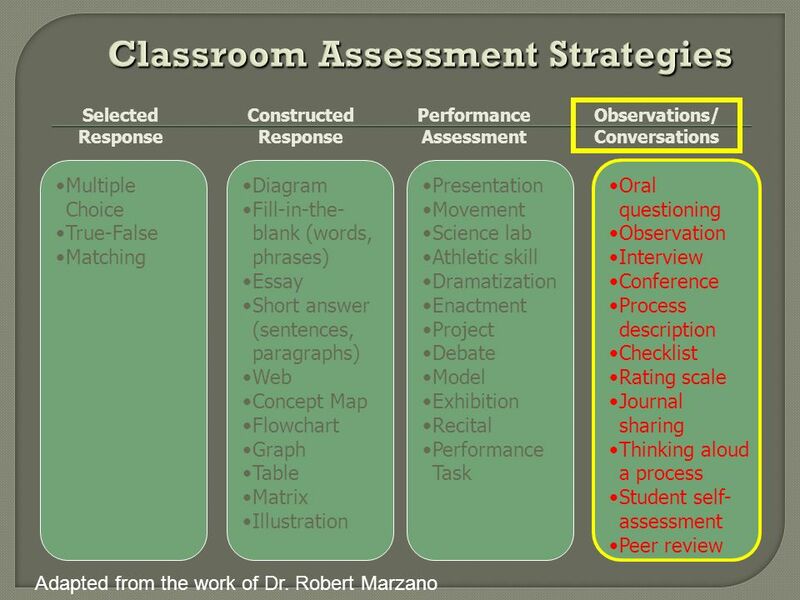 Creating an SLO or PLO Statement Presented by ORIE Team Summer 2013 Academy for Planning, Assessment, and Research. Providing High-Quality Professional Development Session Questions How does the PTLC connect the improvement work to the classroom level? How does the. 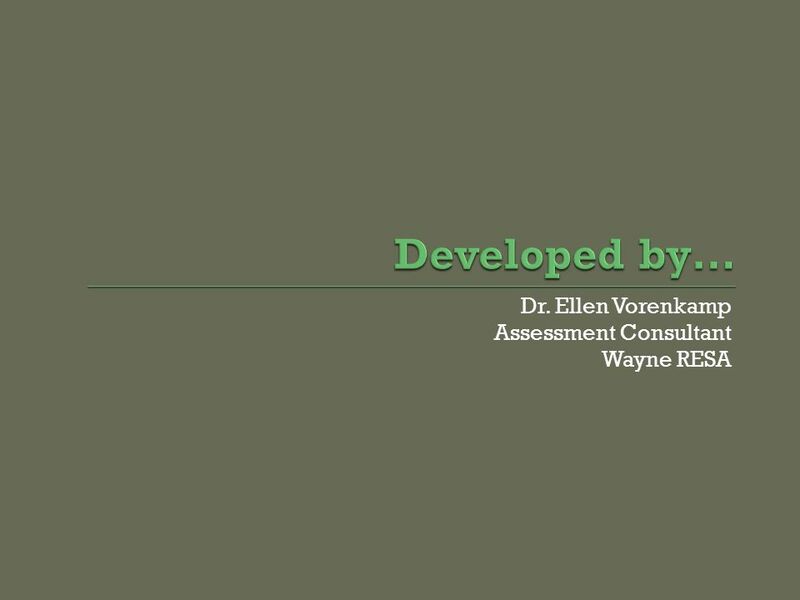 Evelyn Wassel, Ed.D. Summer 2014. 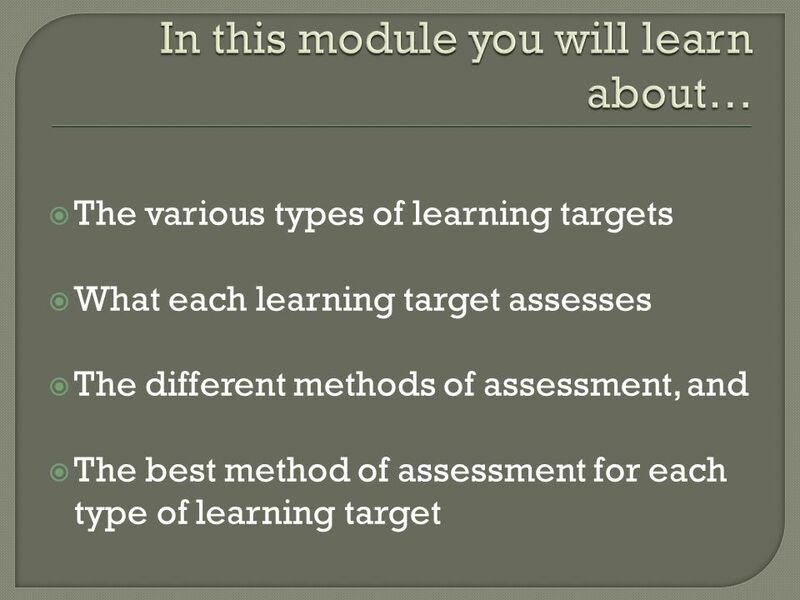  Skilled in gathering accurate information about students learning?  Using it effectively to promote further learning?